Revolution Ballroom is a warm & inviting ballroom studio offering expert instruction for dancers of all ages and abilities. 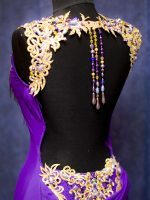 They offer dance instruction in: Ballroom, Latin, Swing, Salsa, Bachata, Argentine Tango, Belly Dance, & Line Dance. More than just learning steps, their classes will teach you proper posture, technique, and lead/follow skills so you can comfortably and confidently dance anywhere while looking and feeling great!